We need a generic abstracted way of manipulating sheets using Apps Script from VBA, since we can’t access the individual SpreadsheetApp methods. I've created a function that provides access into any sheet directly from VBA, and also implemented a VBA version. With each version using the same methods and creating compatible data it's easy to switch from Excel access to Sheets access. These methods would be used in the Apps Script code as a standard way to get and present data to the co-operating VBA process. I recommend always using using getData() and setData() for data transfer. open (id, sheetName) given a sheet id and sheet name open a sheet. (in VBA the sheet id is the path on disk, defaulting to the active sheet and document). get the sheet managed by this SheetExec instance. setLowerCase(lowerCase) whether to convert headings to lower case when making objects out of sheet values. getValues(a1Range , attrib) get the values in a sheet as two dimensional array. Optionally a range can be specified and an attribute other than values (for example FontColors) can be requested. getData(a1Range , attrib) get the data in a sheet as a one dimensional array of key value pairs using the headings row as properties.. Optionally a range can be specified and an attribute other than values (for example FontColors) can be requested. clearContent (a1Range) clear the contents in a sheet. Optionally a range can be specified. convertToObjects(values) converts a two dimensional array of values to a one dimensional array of key value pairs using the first row as the property names. convertToValues(dataOb) converts to a two dimensional array of values from a one dimensional array of key value pairs, inserting a first row of property names as headings. setData(dataOb, a1Range , attrib) convert data to values and write to a sheet using the property keys as the headings. Optionally a range can be specified and an attribute other than values (for example FontColors) can be requested. setValues(values, a1Range , attrib) set the values in a sheet from a two dimensional array. Optionally a range can be specified and an attribute other than values (for example FontColors) can be requested. 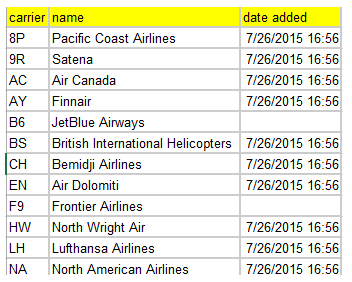 For this example we’ll use a workbook that contains a lookup sheet of airline carrier codes to names. In addition to using this sheet as a reference, this workflow will also maintain a sheet counting the number of times particular flight codes have been encountered. The objective of this step is to replace the data access part of the VBA automation so that it refers to workbook now converted to a Sheet. This function is a generic function to return all the data in any workbook/sheet. This pattern is fairly standard for all execution API access. The project key is used both as part of the request and also to access the Oauth2 entry created earlier. Here’s a small snippet of what get’s returned. This is the function that is executed by Apps Script on behalf of VBA, in order to read a sheet when provoked by the execution API request. Note the function name and options match those passed from VBA. Perhaps the next step could be to write the retrieved data somewhere, or to otherwise process it. Because the SheetExec class is compatible on both VBA and Apps Script, the data transferred between them can be written directly to a workbook without intervention. This executes the previous snippet (testGetSheet) to request data from the sheet from Apps Script, then uses the VBA implementatino of SheetExec to dump that data to a local Excel workbook. This example uses the VBA SheetExec to read data from a local workbook, and sends it to Apps Script to be written to a given Sheet. Note the use of the cJobject.attach method to add the data retrieved from the local workbook to the data property of the first argument required by the receiving Apps Script function. This produces a result like this, and of course the data is written to the selected Sheet. The data produced by the VBA implementation of SheetExec can be consumed without modification by the Apps Script version.